E3-3 The ledger of Custer Company has the following work in process account. (a) How many units are in process at May 31? (b) What is the unit materials cost for May? (c) What is the unit conversion cost for May? (d) What is the total cost of units transferred out in May? (e) What is the cost of the May 31 inventory? data for its Sterilizing Department in selected months during 2014 are as follows. (a) Compute the physical units for January and May. 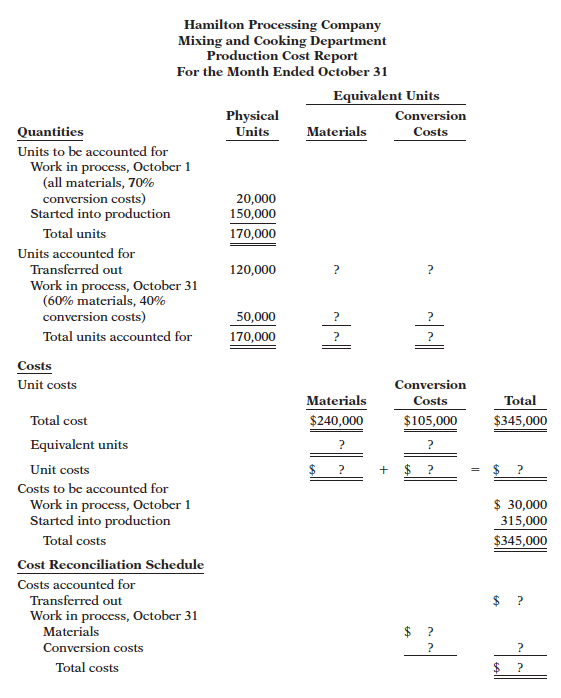 (a) Determine the equivalent units of production for (1) materials and (2) conversion costs. (b) Compute unit costs and prepare a cost reconciliation schedule. Process—Mixing $0, Work in Process—Packaging $250,000, and Finished Goods $289,000. 1. Purchased $300,000 of raw materials on account. 2. Issued raw materials for production: Mixing $210,000 and Packaging $45,000. 3. Incurred labor costs of $258,900. 4. Used factory labor: Mixing $182,500 and Packaging $76,400. 5. Incurred $810,000 of manufacturing overhead on account. were 28,000 in Mixing and 6,000 in Packaging. 7. Transferred 45,000 units from Mixing to Packaging at a cost of $979,000. 8. Transferred 53,000 units from Packaging to Finished Goods at a cost of $1,315,000. 9. Sold goods costing $1,604,000 for $2,500,000 on account. the production cost report, and compute October unit costs.